Essentially zoonoses are infectious diseases which usually affect other animals, but which can also afflict humans. Zoonoses can be contracted through occupational exposure, or other environmental exposure. This page illustrates some diseases of this kind, and closely related ones. This page is being revised. Amongst others, a section on Brucellosis is intended. it malignant in the pathological sense. 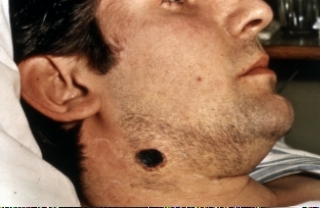 The appearance of the skin lesion gives the name to the disease since it had been likened to a piece of coal (Greek: anthracos). Anthrax is caused by a Gram+ rod-like bacterium called Bacillus anthracis. The spores of this organism are amongst the hardiest pathogenic spores in terms of the length of their survival and their resistance to destruction either within the animal product or in the soil. When man is infected the bacterium multiplies and generates a toxin. The cutaneous form of the disease has the best prognosis of the three types, especially if recognised and treated early with appropriate antibiotics. The pulmonary form tended as had been contracted by woolsorters tended to be fatal as a result of a severe pneumonitis as well as sytemic effects. Most manifestations of the disease feature a necrotising lymphadenitis. Thankfully this is a very rare condition in the UK, with perhaps to the order of only one new case per year. However it can present in tourists returning from parts of Africa where it is endemic. Orf is a viral infection of sheep, goats and cattle. It is said to be the Anglo Saxon word for 'cattle'. Sheep in the lambing season, may shed Chlamydiae with their afterbirth in particular, and these organisms can be responsible for abortion in humans. What may appear to be a fairly safe and idyllic rural acticvity might in fact therefore present a significant risk to human reproductive health. Other organisms which may cause serious health hazards to pregnant women in the lambing season include Listeria and Toxoplasma. Read more about hazards of farming.